LED driver for all of our single color and RGB controllers to expand power output, it supports PWM control and can connect one to three times more LEDs by adding one more power driver and unlimited power drivers can be connected together. 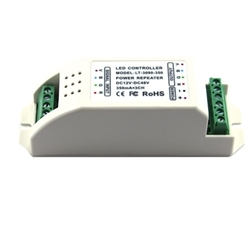 The LED driver provides constant voltage power and current power that can be connected together which is perfect for controlling LEDs with different voltage and power. Unlimited quantities of power driver can be connected together. The in-phase possibilities are not restricted by any number of drivers. LED driver for RGB controllers provides constant and current power that can be connected together for controlling LEDs with different voltage and power.